While checking out Gizmodo the other day, I noticed there is a new bittorrent box coming out called the Myka. 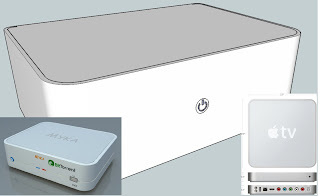 Surprisingly, the overall design is very similar to what I am building... and reading through the article, found some links to the Apple TV box. Gives me a bit of confidence that if my handyman-ship work is OK, then mine may end up looking not too shabby.